Earthworks of a medieval moated manor and associated complex, part of Santon deserted medieval village. The moated site is sub-rectangular in plan and the ditch has become partly infilled. Boundary features and other features can be seen around the moat. Surface and metal detected finds of medieval pot and other artefacts provide further evidence that this is the site of Santon deserted medieval village. 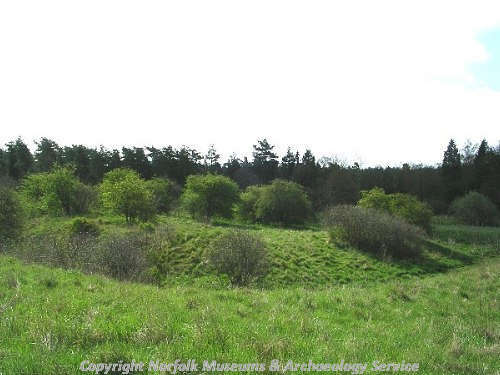 Earthworks of deserted medieval village and moated manorial site. Medieval sherds and flint flake. 1988 to 1989. Casual finds. Worked flints, medieval and post medieval sherds. April 1995. Earthwork Survey and Archaeological Assessment. Other than the well defined moat the surface remains are of limited extent and form. Medieval sherds and tile found. See report (S1) for further details. A. Rogerson (NLA) 30 March 1997. During construction of wheelchair access, patch extensions and river dredgings at Santon moated site, Lynford. No archaeological finds or features. C.F. Mecksepper (NAU), 22 May 2000. Scheduled Ancient Monument Management Plan March 2002 to March 2007. D. Gurney (NLA), 24 April 2002. One base sherd of post medieval glazed red earthenware. One undated irregular fragment of lead. Undated bi-conical lead weight (46.55g) with central perforation. E. Darch (NLA), 25 November 2003. January/February 2004. Surface finds in disturbed ground near car park. Roman, Late Saxon, medieval and post medieval sherds. --- Article in Serial: Allison, K. J. 1955. The Lost Villages of Norfolk. Norfolk Archaeology. Vol XXXI pp 116-162. pp 156. --- Scheduling Record: Corbishley, M.. 1983. AM107. --- Unpublished Document: Sussums, K.. 1995. Watching brief - St Helen's picnic site, Lynford, 19/7/95. 20 July. --- Publication: JGC. 1969. AM7. --- Monograph: 1846. Guide to the Norfolk Railway. --- Archive: Clarke, R. R. and NCM Staff. 1933-1973. Norwich Castle Museum Record Card - Medieval. Lynford. <S1> Unpublished Report: Cushion, B. 1995. St Helen's Picnic Site, Santon. Brief Archaeological Assessment for Forest Enterprise. Earthwork Survey Report. <S2> Unpublished Document: English Heritage. 2002. English Heritage Management Agreement.